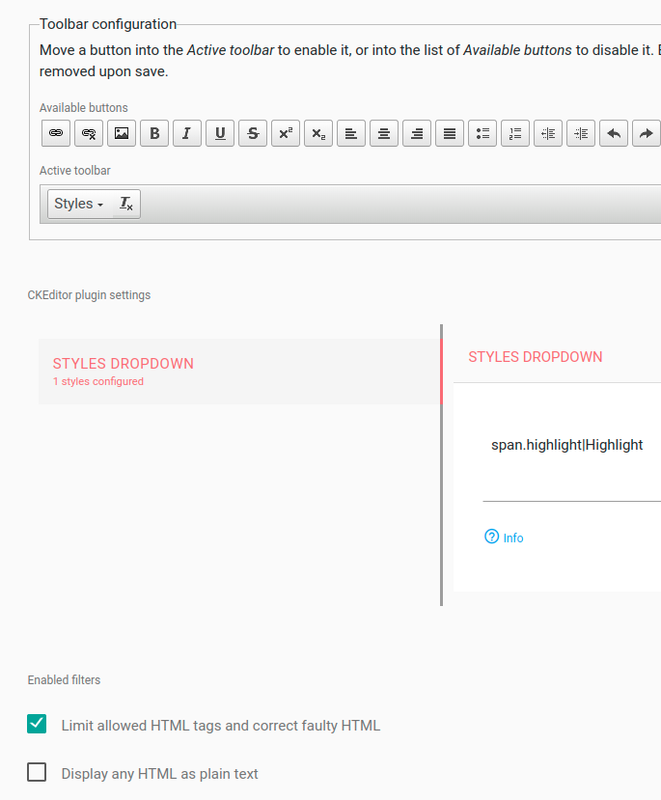 I'm trying to export the CKeditor settings and restricted_html settings but it's partially imported in the end. I'm exporting the editor.editor.restricted_html.yml and the filter.format.restricted_html.yml files but I'm not getting the correct settings for enabled filters upon installation, but I'm getting the styles dropdown config for example. This results in an empty styles dropdown in the editor for the end user. Browse other questions tagged 8 importing-exporting wysiwyg configuration-management input-formats or ask your own question. How do I remove all default styles (such as div.widthMarker) from CKEditor? Why does simpletest report a missing schema for my Drupal 8 module? How can I style the WYSIWYG content?